Wilhelmine and Peter Zwar were expecting their fourth child. Her mother in law Magdalena Zwar was the District midwife and delivered all of her grandchildren. As usual ‘Lena’ had come to help with the children and the next delivery. On the 8th of April, Wilhelmine was not feeling well and had gone to bed to rest. The three children Hermann, Agnes and Alfred went to play among the fertiliser bags stacked in the straw roofed shed about 35 metres from the house. In a tragic accident a bag fell on Hermann and also knocked Agnes over. Agnes and Alfred were O K but the bag of fertiliser had broken Hermann’s neck and he died on the spot. Their grandmother Lena had come out to check on the children and furiously dug Hermann out from under the fertiliser and discovered the tragic death of her grandson. None of the men were home at the time. 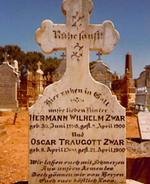 The shock for his mother Wilhelmine was so great she went into labour and Oscar Traugott Zwar was born the same day. Oscar would only live for 13 days. Wilhelmine and Peter Zwar had lost two of their children in two weeks. Two more children, Marie and Edgar would later be added to the family, never having known two of their brothers.